Cozy Lake Home - Spectacular View of Old Hickory Lake. 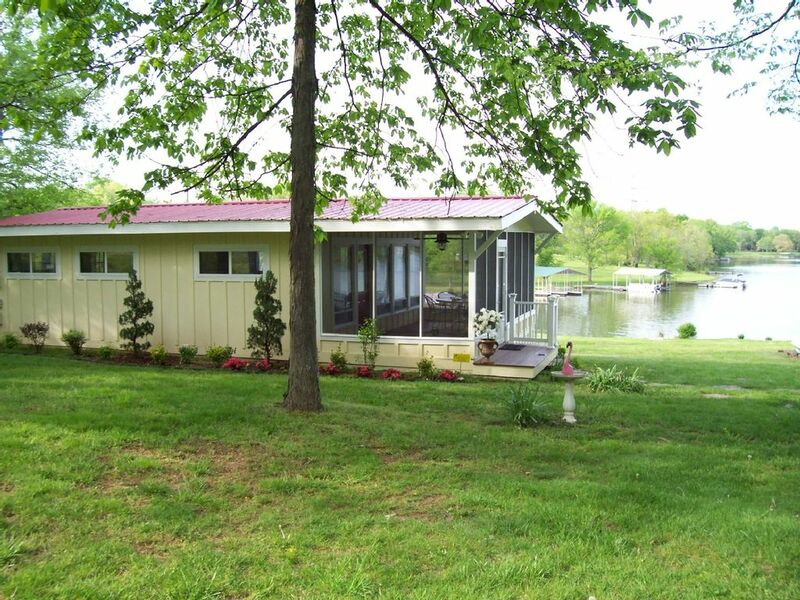 This lakeside cabin: - Come enjoy our waterfront cabin on the shores of Old Hickory Lake. Sit a spell on our cozy screened-in porch. Bring that book you've been longing to read. Take a stroll down to the lake. That big catch is waiting for you! Or work on that tan! As night time falls, the lake turns into a magical, serene retreat. The song of bullfrogs echo and lightning bugs flicker. The moon comes up and sparkles on the water. A great night's rest, then experience sunrise! The birds come to life. Catfish are jumping, Herons are poised for breakfast and the ducks and geese glide through the water. You'll never forget the view. Community Parks/Shopping/Boat Ramps: - The lakehouse is three miles from Laguardo Recreation Area with a sandy beach, picnic areas & swings for the kiddies. Eight miles from Community Park with a stockade playground, children's wading pool, walking & biking trails. Huge outdoor and indoor pools with water features, weight rooms, basketball, aerobics and racquetball. Outlet malls & indoor malls. Check out the Opry Mills Mall - with the Bass Pro Shop. Maple Hill Sports Center's new facility has batting cages, arcade, miniature golf & birthday party room. Maple Hill Driving Range, Hunters Point Golf Course. Cedar Forest State Park has horseback riding. Lebanon is renowned for its antique shopping, on & off the Public Square. Lebanon is the proud home Cumberland University,the award winning Wilson County Fair, and CABA - Continental Amateur Baseball Association. toilet, combination tub/shower, Plenty of towels! - Refrigerator, Stove, Oven, Coffeemaker, Toaster, Microwave, Televisions, Cable, Radio/Alarm Clock, Central Heat and Air, Linens, Towels, Charcoal Grill. We really appreciate you took your time to write a review for the cabin. We try to make the cabins so you feel like home on the lake. We will be looking forward to your return. Thank you for staying with us. Close to home get away. Not only was our cabin very neat and clean. The entire property was very well maintained. My husband and I went here to just slow down for a few days. Moonlit Bay is exactly what we needed. The sun rising and setting on the water was absolutely beautiful. The cabin had all the comfort of home along with the peace of being away from home. We will definitely be back. If anyone wants a little piece of heaven in Wilson County, this is it. Wonderful stay in Moonlit Bay Cabin! So great that you have taken your time to make a comment about the cabin and us!! We always try to make your stay one you remember and want to come back to! Debbie has tried to make the book up to date and always add things to the refrigerator front on things happening that week. we can not say how great our guests are and how awesome the leave our cabins. Thank you for your comments and we will see you soon. Our 3 day stay was Wonderful... nice, quiet, and clean. We loved the many windows where we could view the lake. Screened in porch Awesome. We walked to lake to fish. We will definitely be back. We always appreciate when our guest take their time to write a review on the cabins. We try hard to make your stay wonderful and we will look forward to seeing you again. We alway enjoy great people like you guys. We thoroughly enjoyed our stay at the Moonlit Bay cabin! It was very clean and organized and felt cozy. We enjoyed being so close to the lake, paddle boats, campfire, and having the screened in porch was awesome! It was nice that it was close to Nashville and we could go into town for the evening! We really enjoyed our stay and will be returning! Very accommodating people and helpful with us being out of town to help us navigate and understand the geographical location. Highly recommend! We are so glad that we made your vacation a memorable one. We like to help you get to know the area and all it has to offer. We like living with the cabins so we can help if needed. We will look forward to your repeat visit. Thank you for taking time out of your day to give us a review. This cabin was very clean and quiet. If you are used to sleeping in total darkness like my husband and I, light does come into the windows from lights on other properties. We had a great stay and got to see a total eclipse of the sun. One thing that really should be mentioned is that the bed is a double not a queen size as mentioned in the cabin description. I would recommend this cabin to anyone looking for privacy and quite. We are so glad you had a wonderful stay at our Moonlit Bay Cabin and was able to experience the once in a lifetime total eclipse. All the windows in the cabin have blinds. We find that the majority of our guests prefer to leave them open and enjoy the beautiful lake scenery; watch the sun come up in the mornings; and the moon light glisten on the water. The bed is queen sized and we also have a queen sized sofa sleeper. Convenient to Nashville, only 25 miles. This lakeside cabin is just 3 to 4 miles from four different boat ramps. Located between Lebanon and Mt. Juliet, and Lebanon and Gallatin, Tennessee.